The "almost" entire group picture of symposium participants. The "birthday boy" Vladimir Agranovich is the 7th person from the right in the front row. 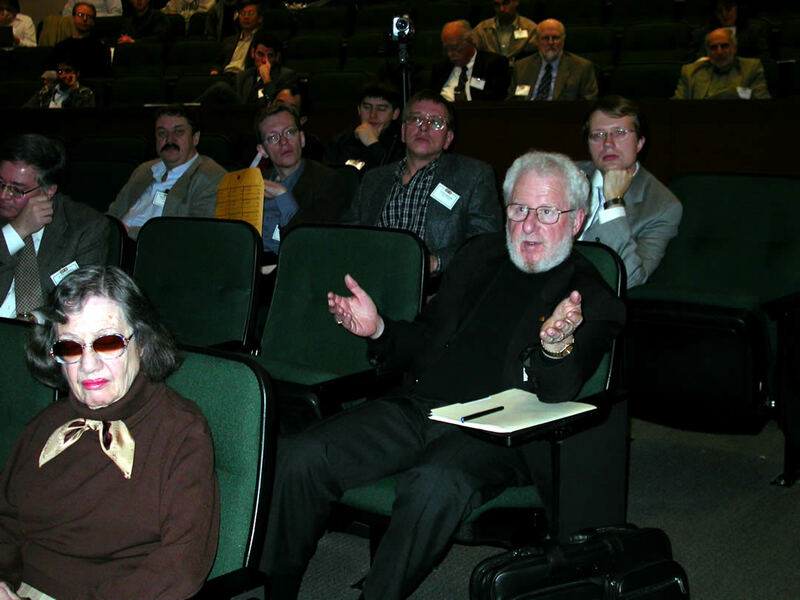 The next two persons on Agranovich's left are Alan Heeger and A. 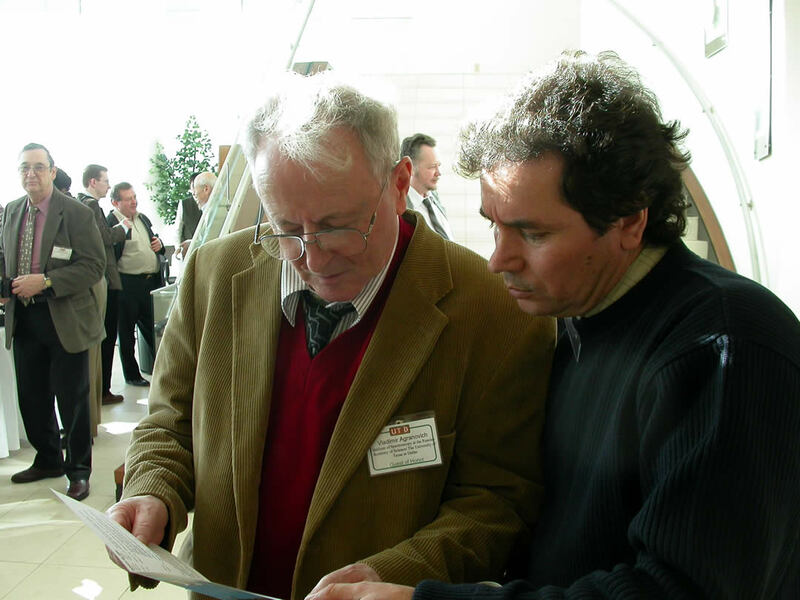 A. Abrikosov, the Nobel laureates for Chemistry of 2000 and Physics of 2003, respectively. The main organizer of the conference Professor Anvar Zakhidov, Deputy Director of UTD's NanoTech Institute, is giving an animated description of the conference logistics. 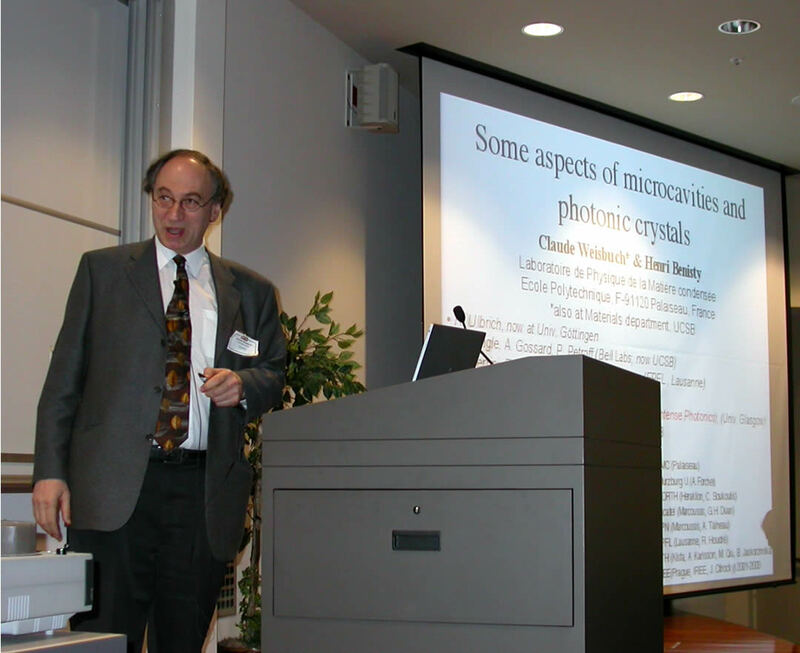 Eli Burstein of the University of Pennsylvania, Agranovich's scientific colleague of many years, giving a very interesting talk on C60. 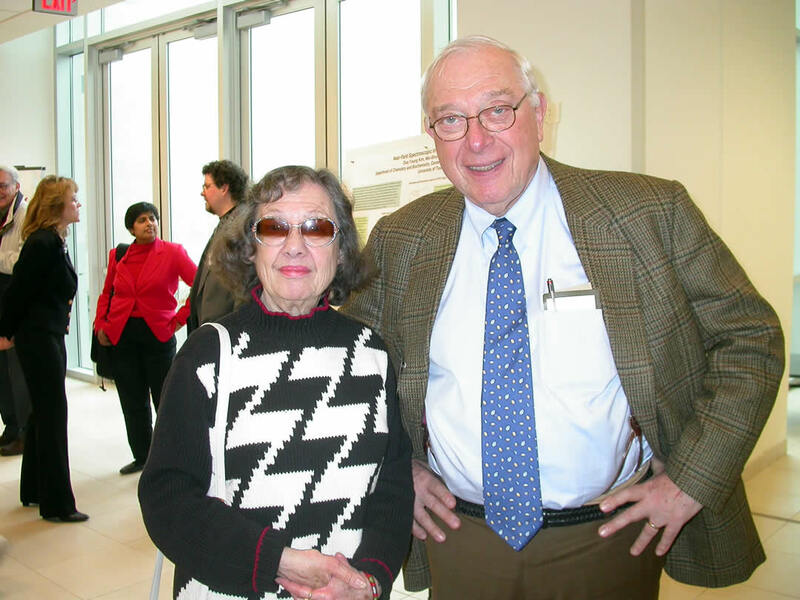 Two scientific giants having a reunion: Esther Conwell of the University of Rochester (on the left) and Joe Birman of the City College of New York. 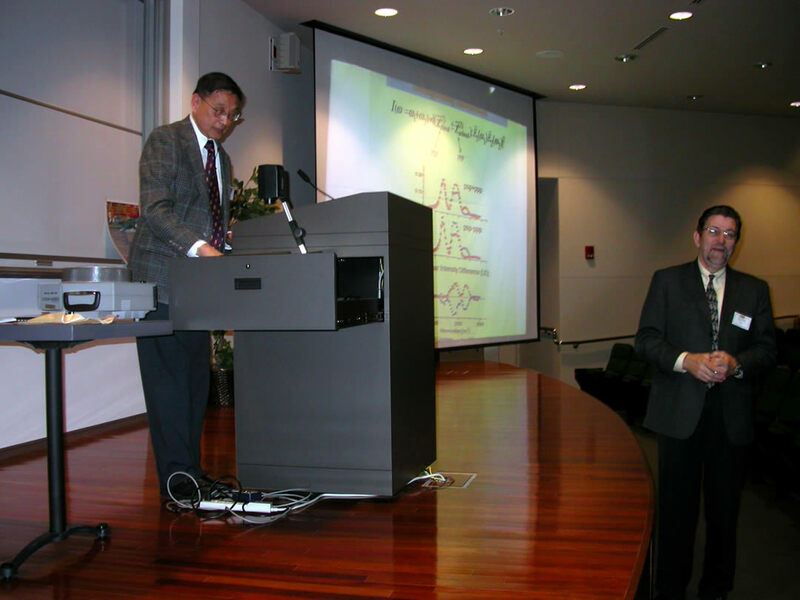 Da Hsuan Feng, VP for Research and Graduate Education of UTD wondering to himself: "Who am I and what am I doing here?" 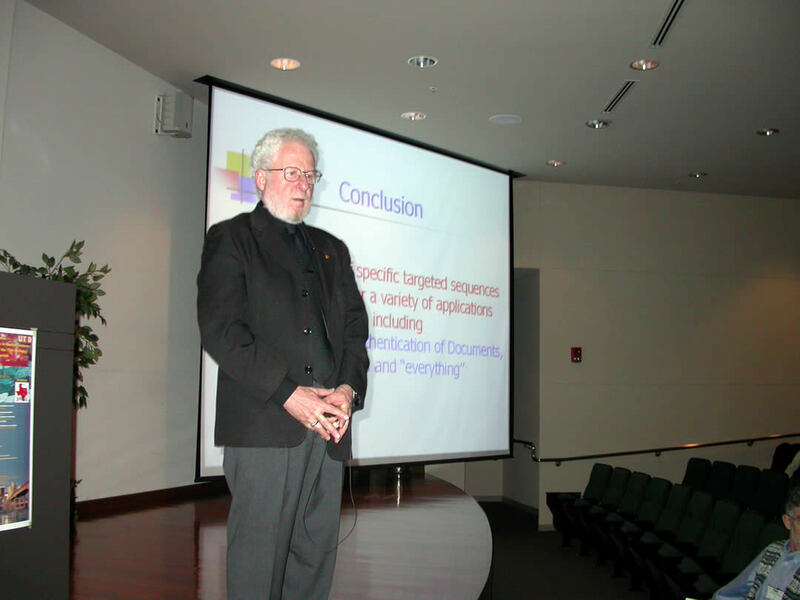 Nobel laureate in Chemistry of 2000 Alan Heeger delivering some new and exciting research results on nanobiotechnology. 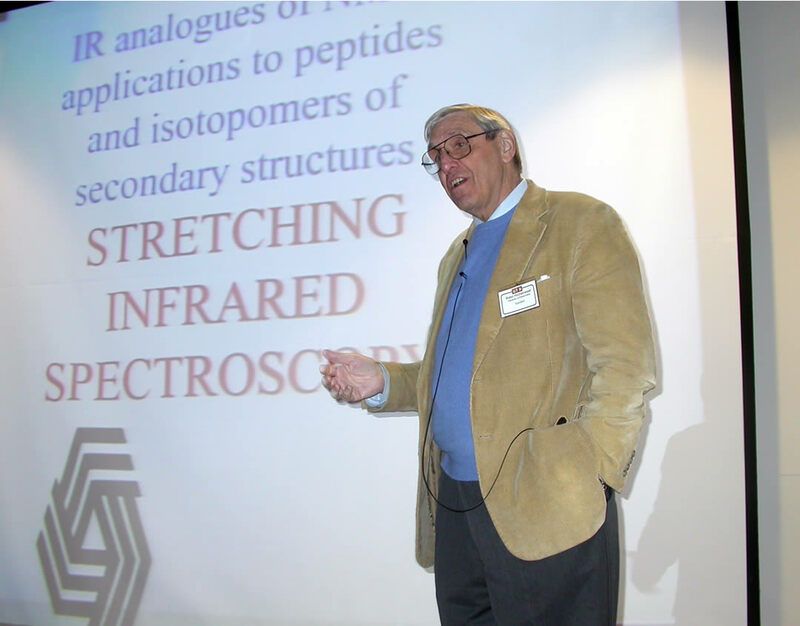 Robin Hochstrasser of the University of Pennsylvania, also Agranovich's scientific colleague of many years, giving a very interesting talk on nanobiotechnology. 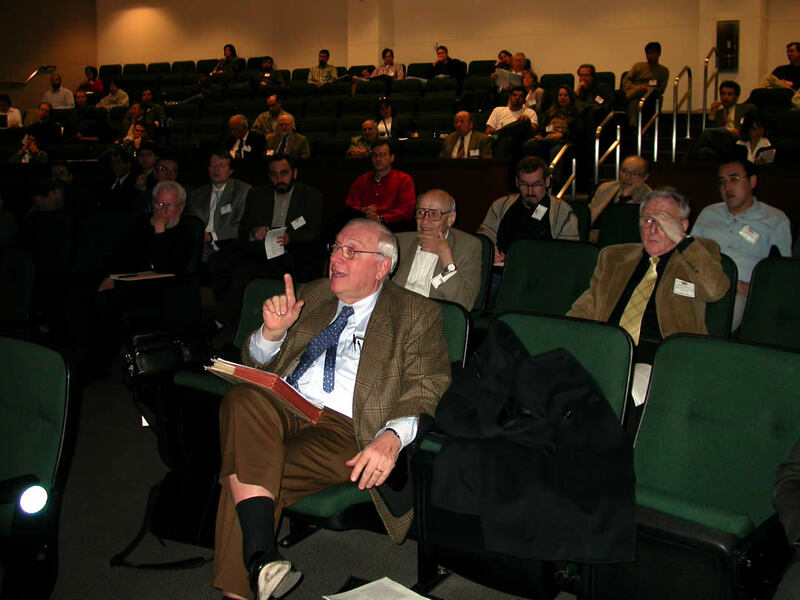 There are always intense discussions going on among all the participants in the Symposium. 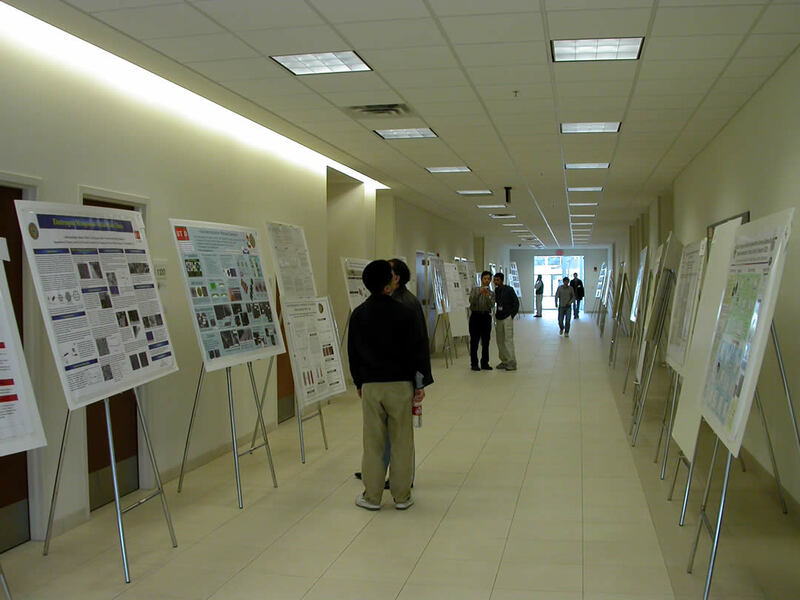 Behind the scenes are some of the 40 magnificent posters displayed during the Symposium. 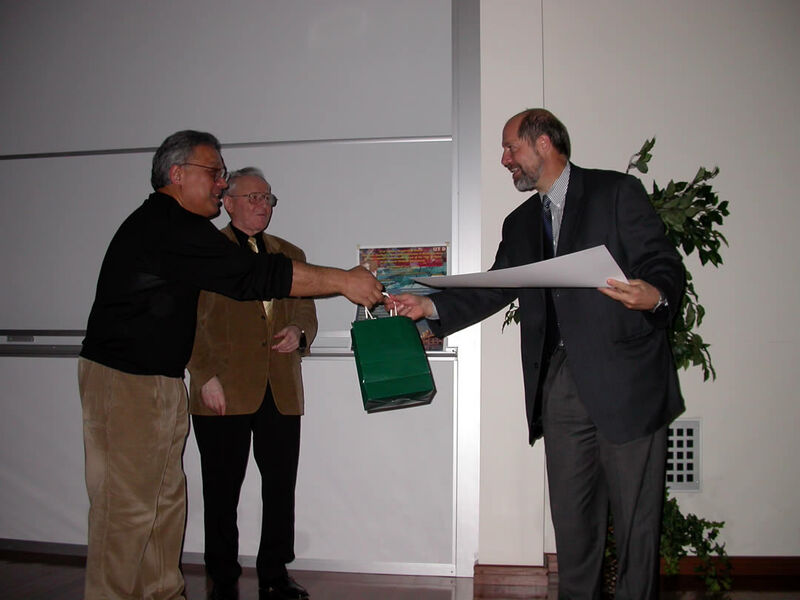 At the end of the conference, an award was given to the best posters. 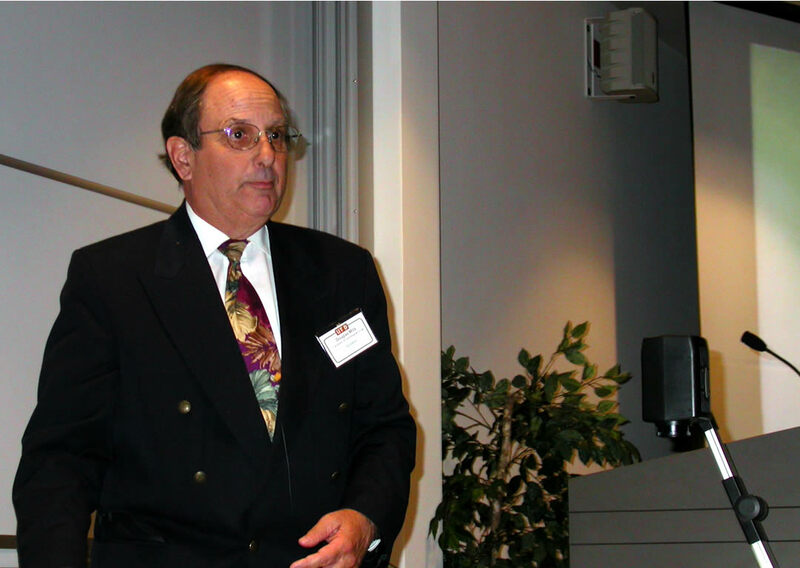 This picture shows that Ray Baughman, the Director of UTD's NanoTech Institute receiving the award on behalf of the authors of the poster. Da Hsuan Feng and Ray Baughman "passing each other in the night". 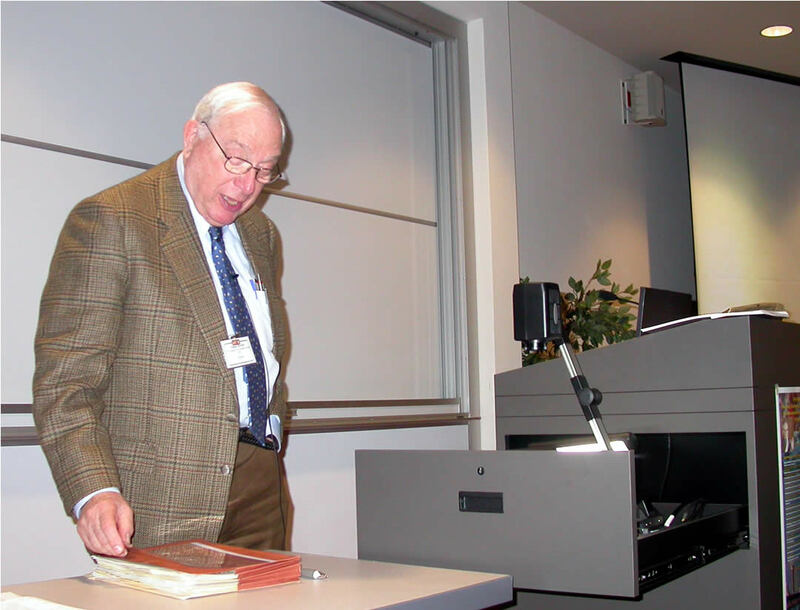 Ray Baughman describing his work to the audience. 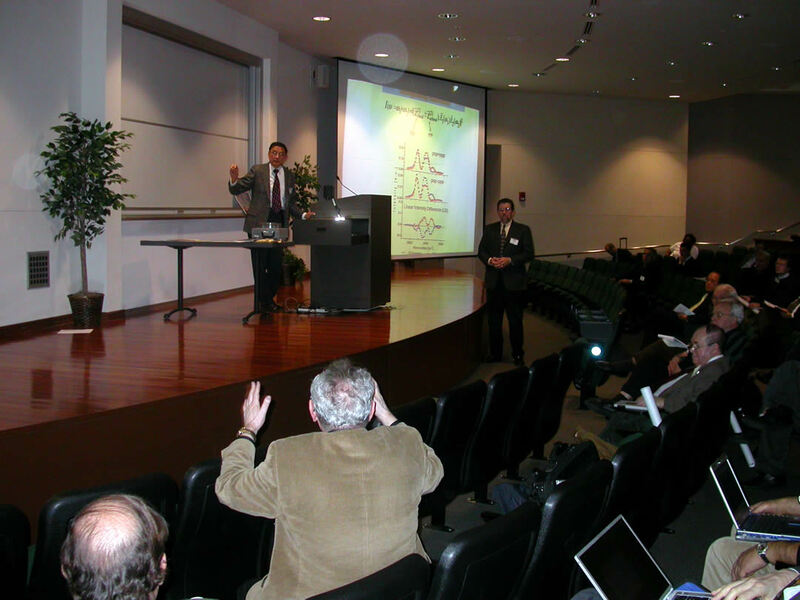 One of the most outstanding scientists in nonlinear optics, Professor Y. Ron Shen of University of California at Berkeley discussing his new research work to the audience. 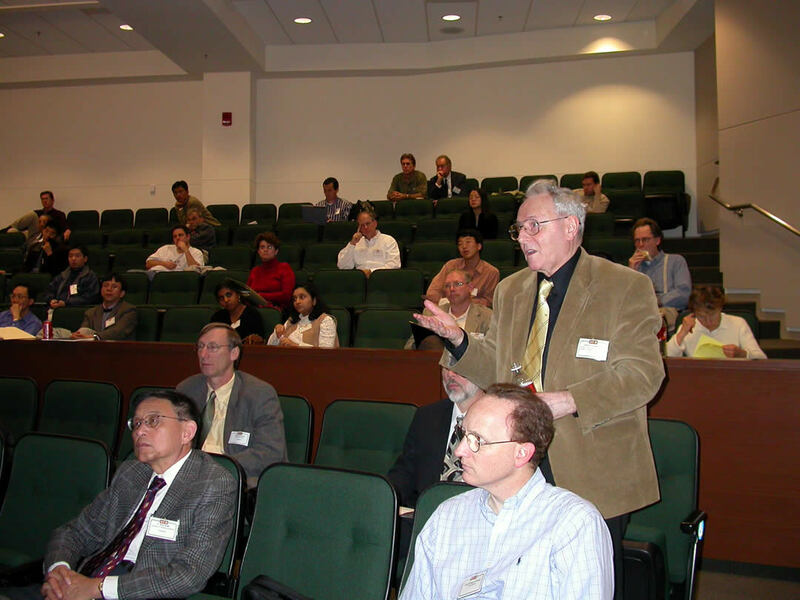 Ron Shen answering a question from the audience with the Chairman of the Session Dr. Alex Ignatiev of the University of Houston. 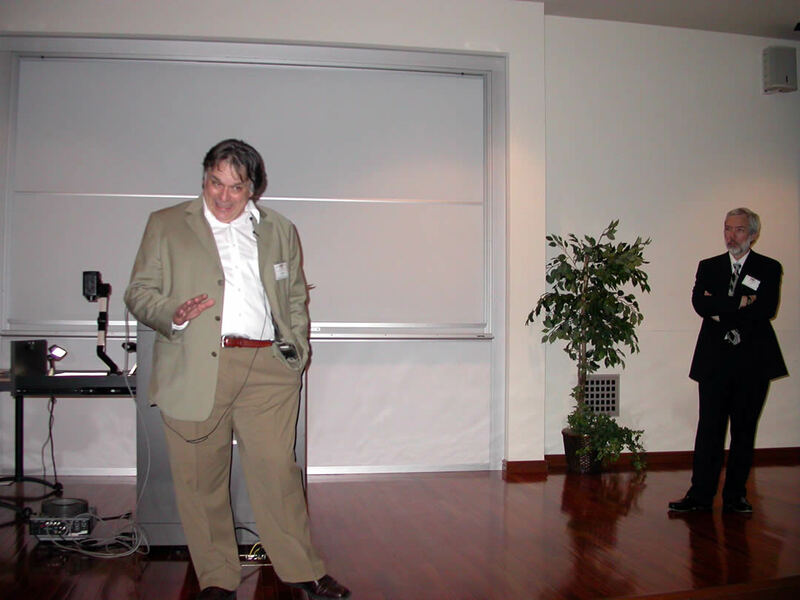 Picture 14: Ron Shen and Agranovich is having an intense and animated discussion about Ron's presentation. 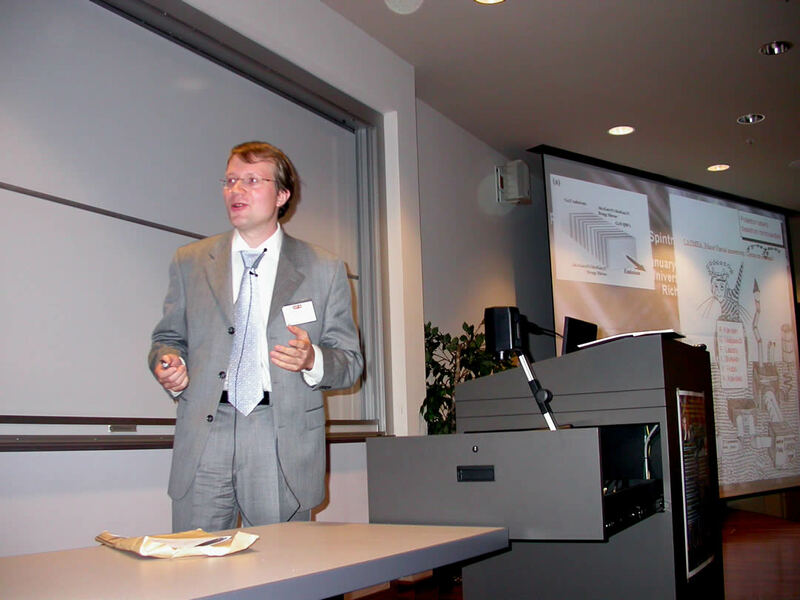 One of the national experts in nanomedicine, Professor Vladimir Torchilin of Northeastern University giving an extremely interesting talk on the subject. Torchilin answering one of the many questions from the audience. 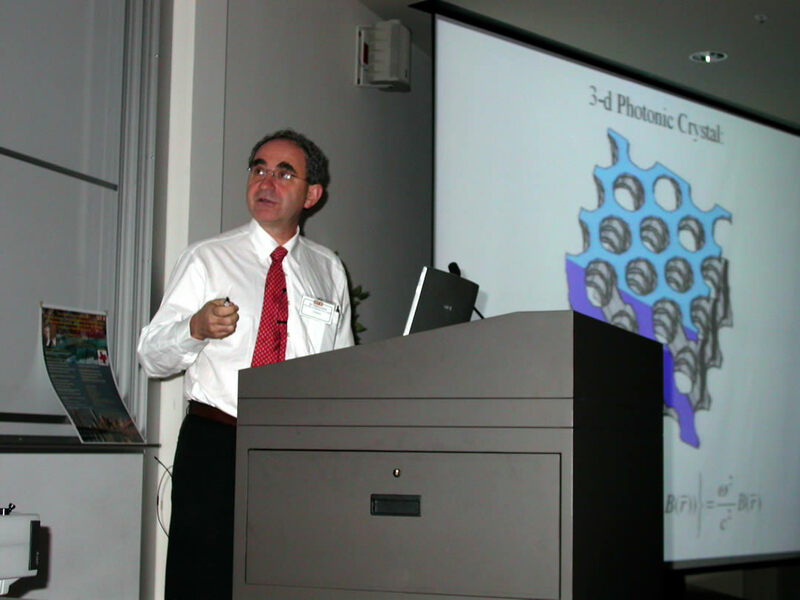 Claude Weisbuch of Ecole Polytechnique in France giving a talk about photonic crystals. 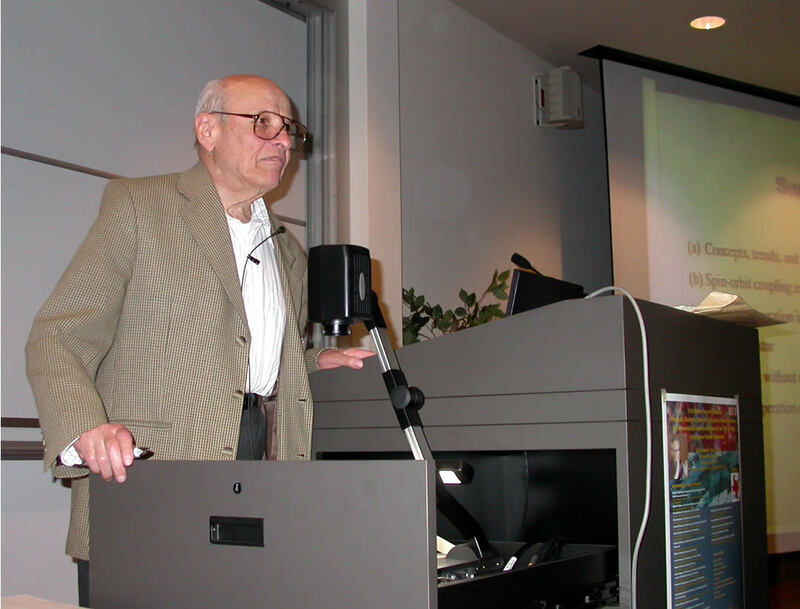 "Father of Photonic Crystals" Eli Yablonovitch describing his latest results to the audience. 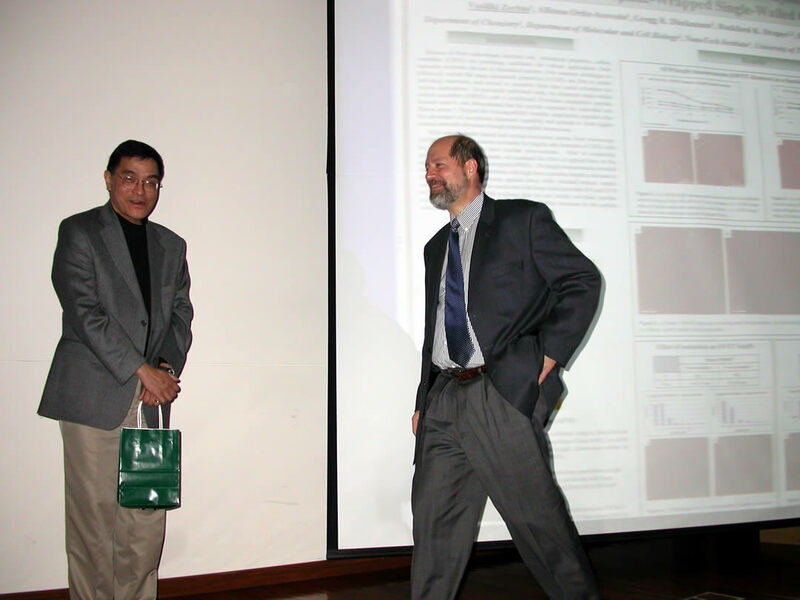 Year 2003 Nobel laureate in physics A. 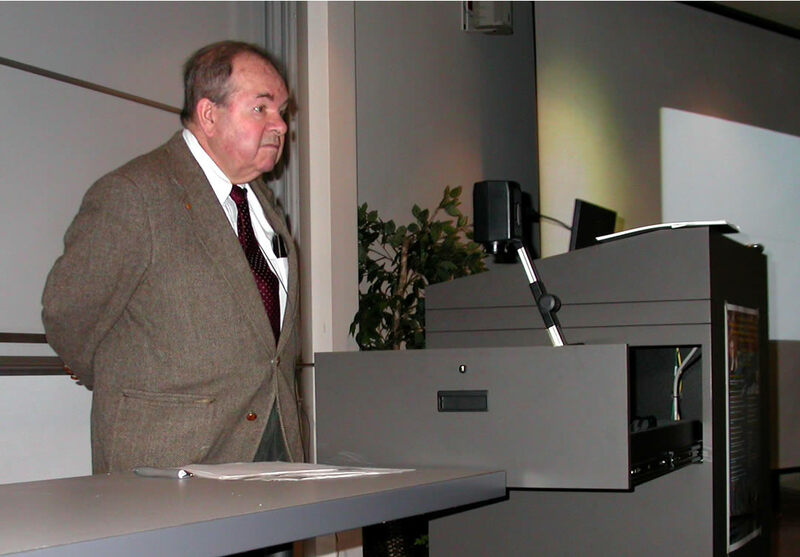 A. Abrikosov of Argonne National Laboratory delivering his speech at the Symposium..
Anvar Zakhidov describes his learning days with Agranovich. 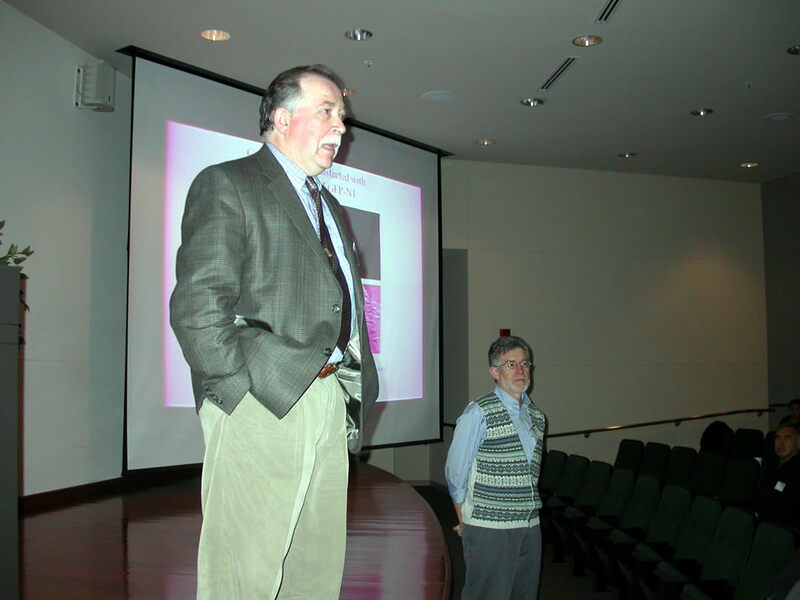 Joe Birman raising a point with one of the speakers. Joe is quite a fellow since he and a few others sat through, and probably understood, every talk presented in the Symposium. 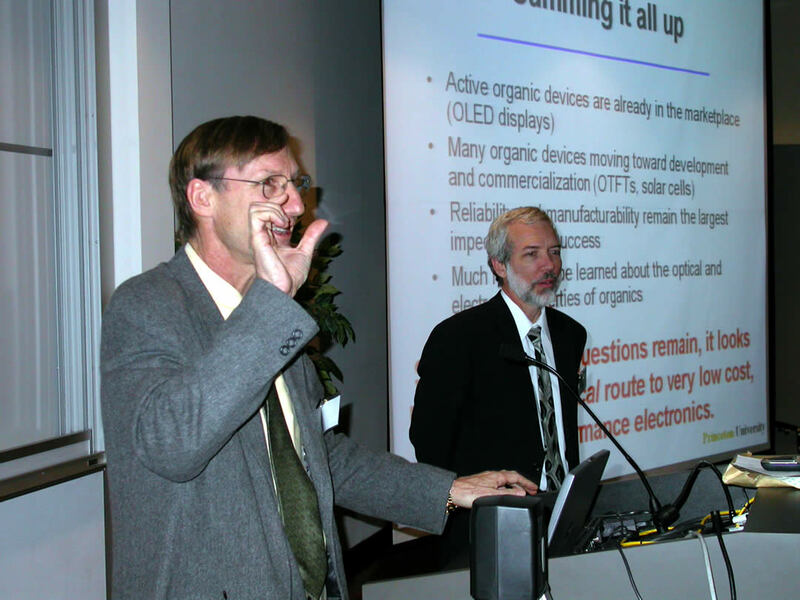 Alan Heeger making a scientific point. 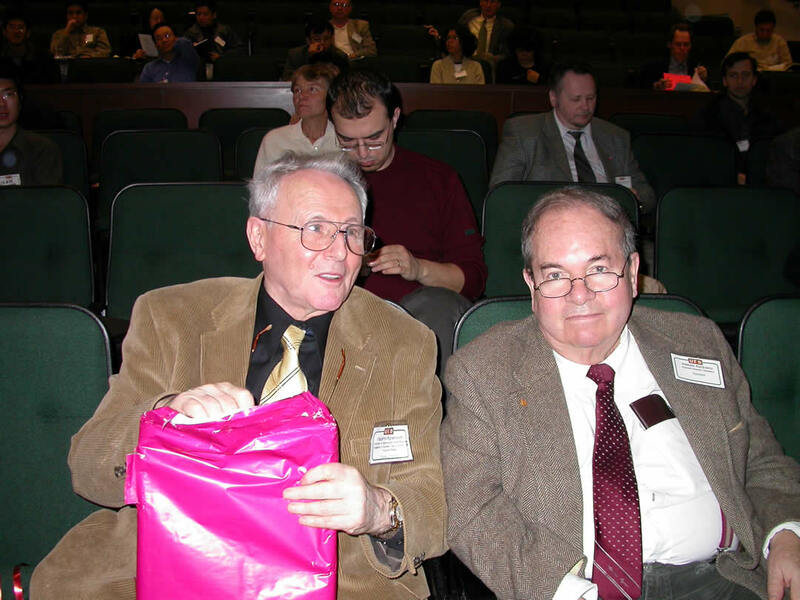 Two old buddies of 50 years, Agranovich on the left and Abrikosov. It is amazing that despite of scientific disagreements at times, they show such deep friendship! 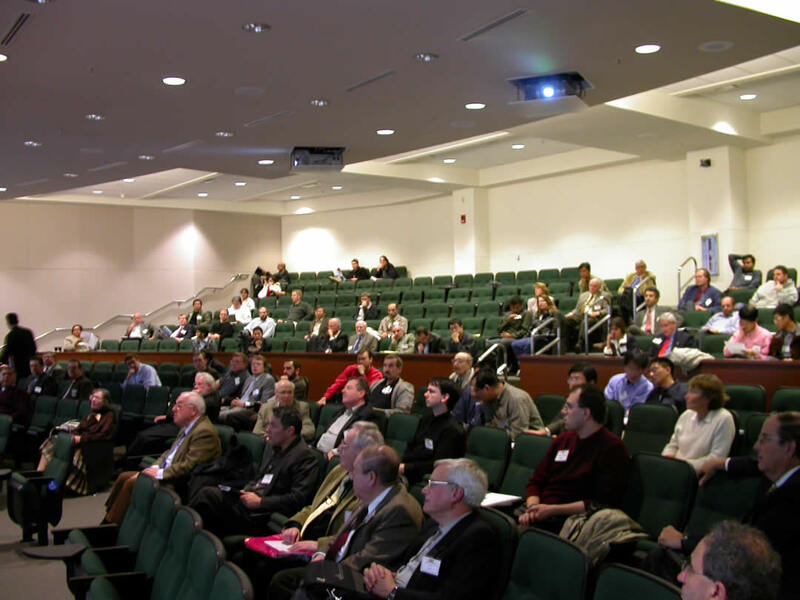 A picture of the audience. 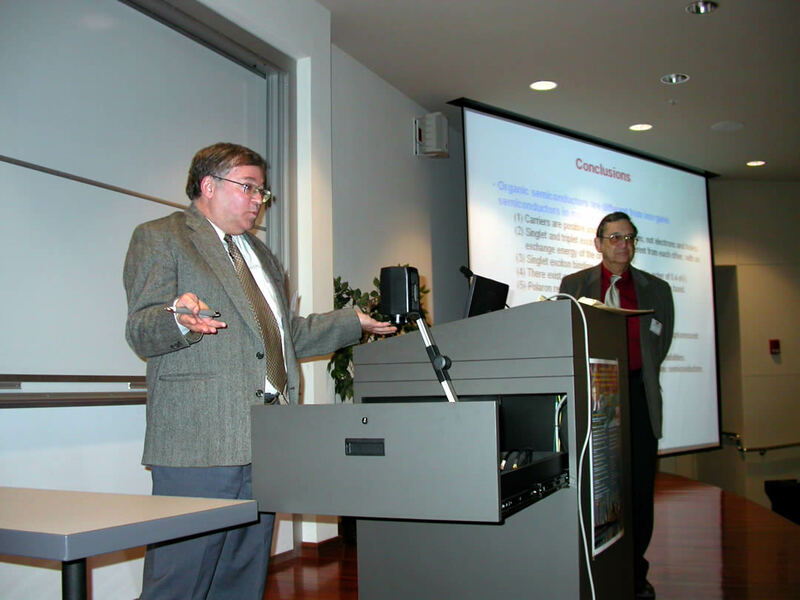 During the Symposium, Agranovich asked questions at the end of nearly every talk. Here is one of them. 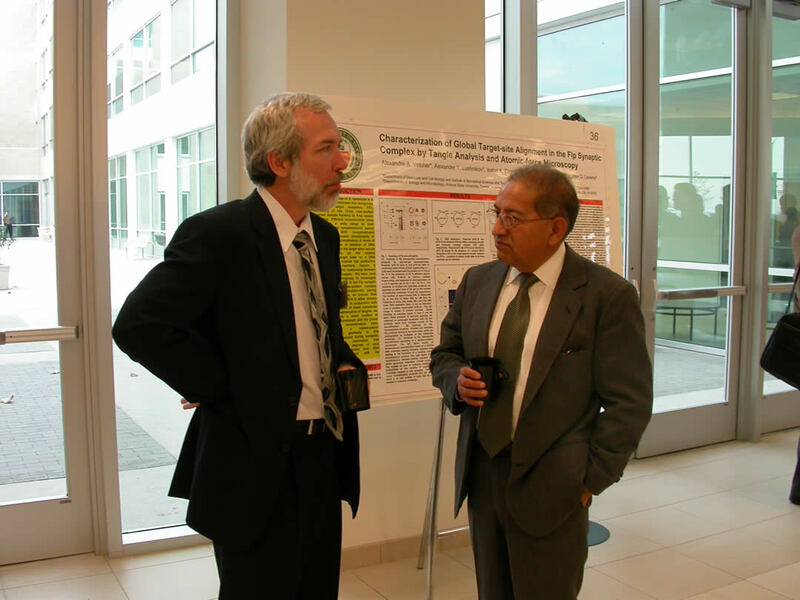 UTD�s good friend Paul Barbara of UT Austin musing on a scientific point. 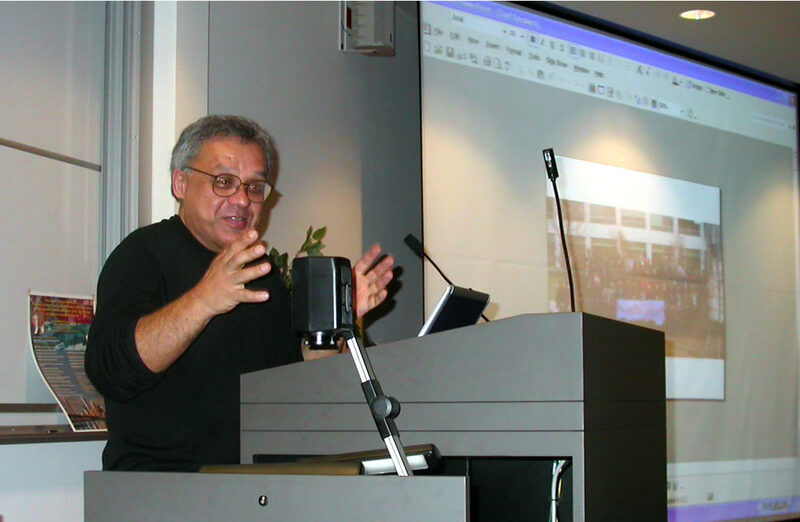 Joe Birman of CCNY delivering his talk. 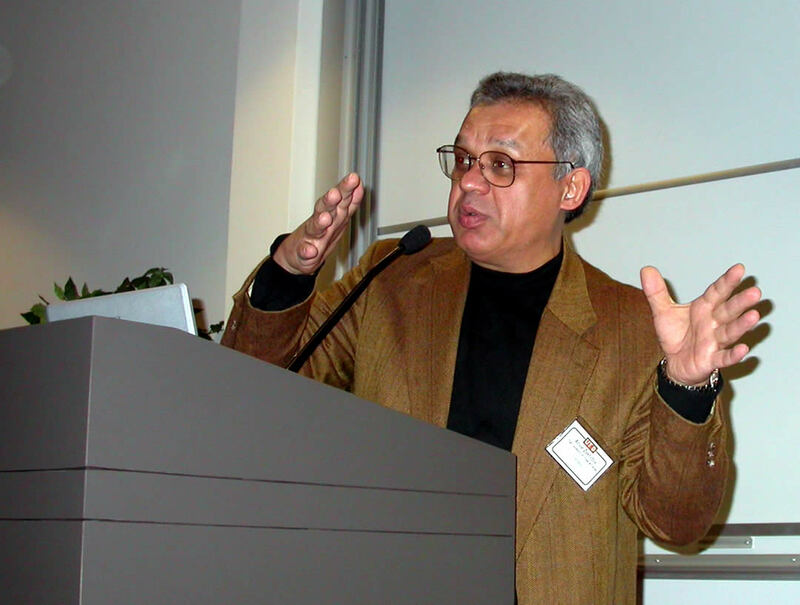 Professor Manuel Cardona answering one of the questions raised by Agranovich. 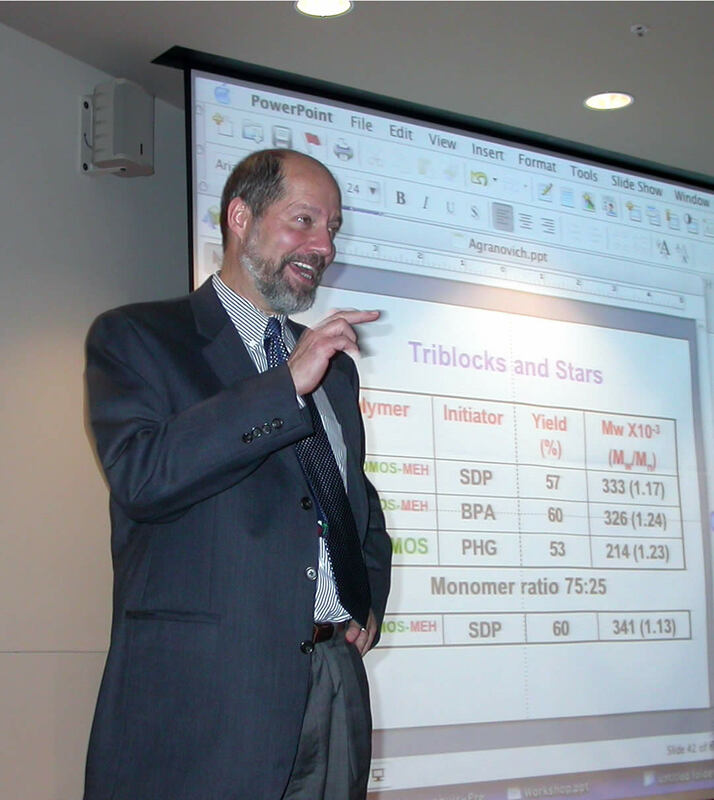 UT Arlington�s Interim Vice President for Research Ron Elsenbaumer welcomes the speakers of the session he was chairing. 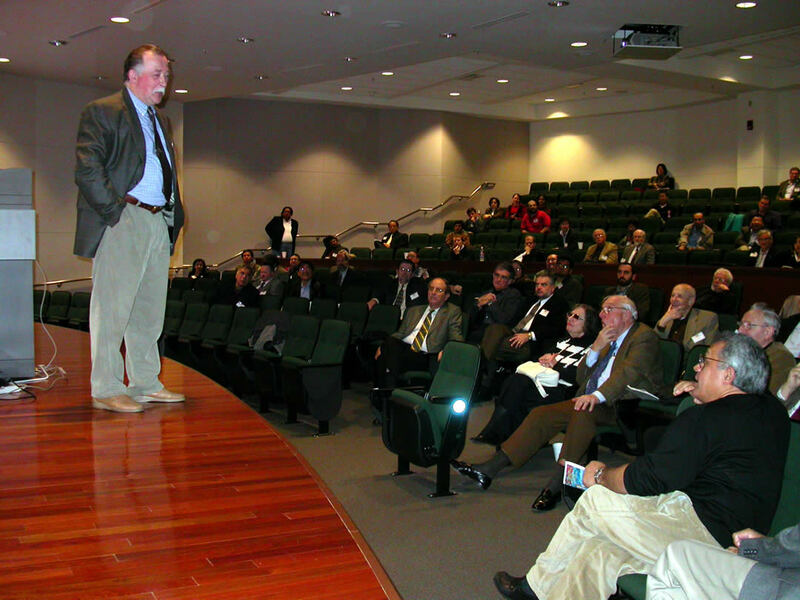 Steve Forrest of Princeton explaining a concept to the audience. 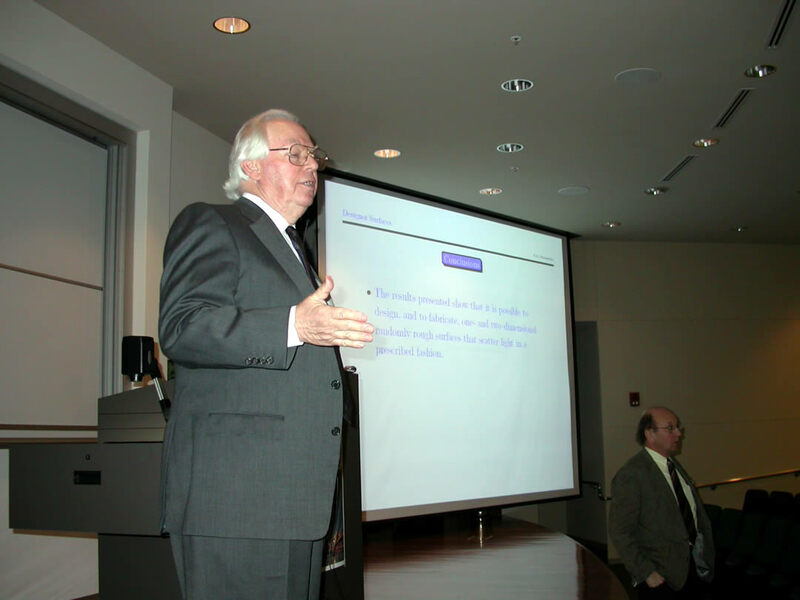 Chairman of the session James Von Ehr was in the background. 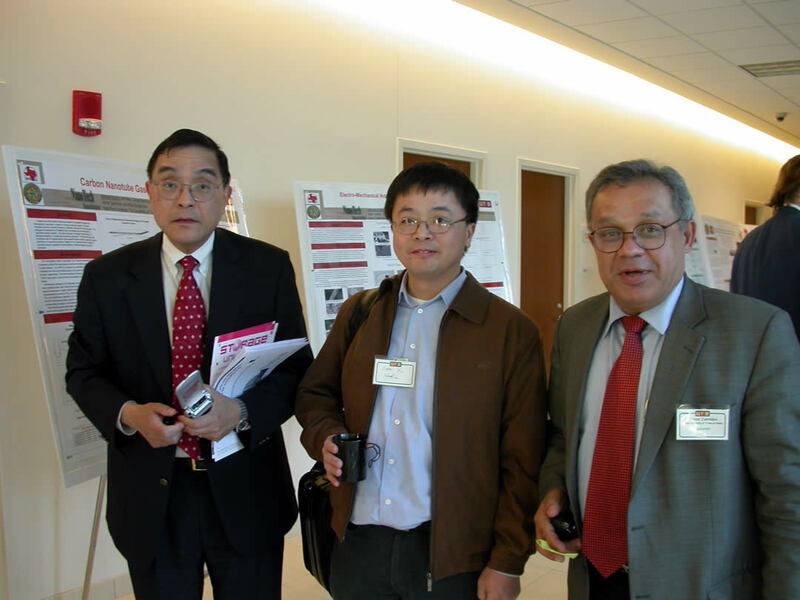 Da Hsuan Feng (left) and Anvar Zakhidov (right) with a guest from Industry at the conference. Agranovich and Ali Aliev of UTD discussing during one of the break sessions. 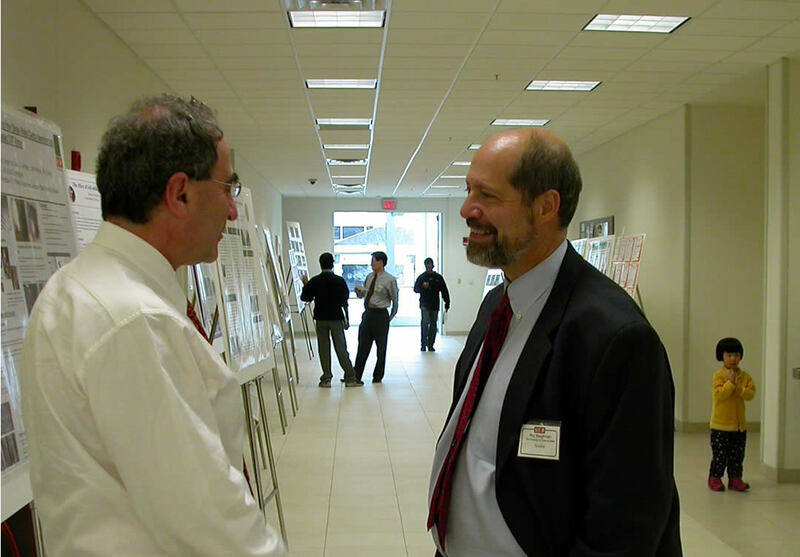 Joe Birman (right) and Abrikosov having a scientific dialogue during a break. 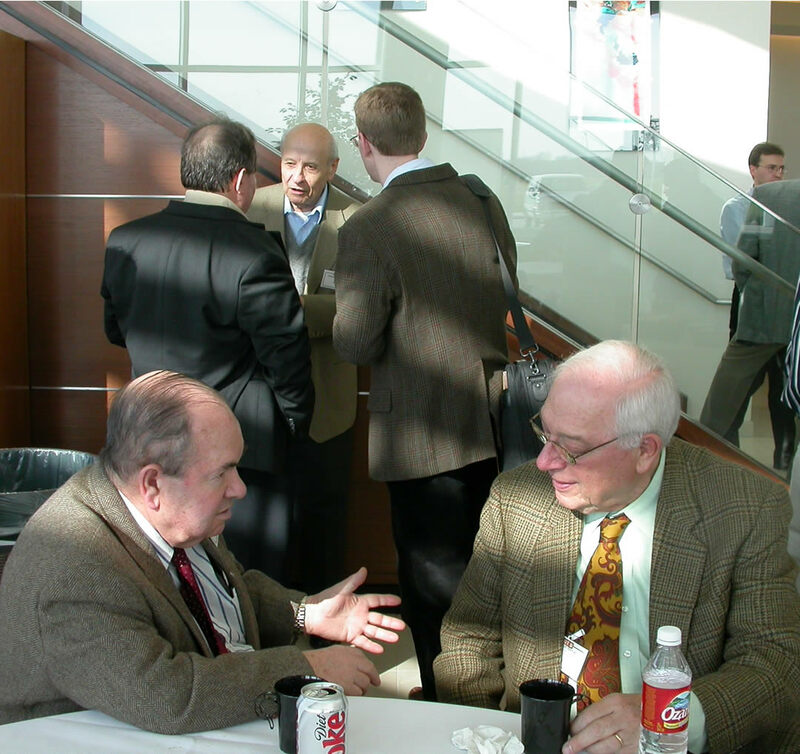 Such discussions between attendees were common and prevalent throughout the Symposium. 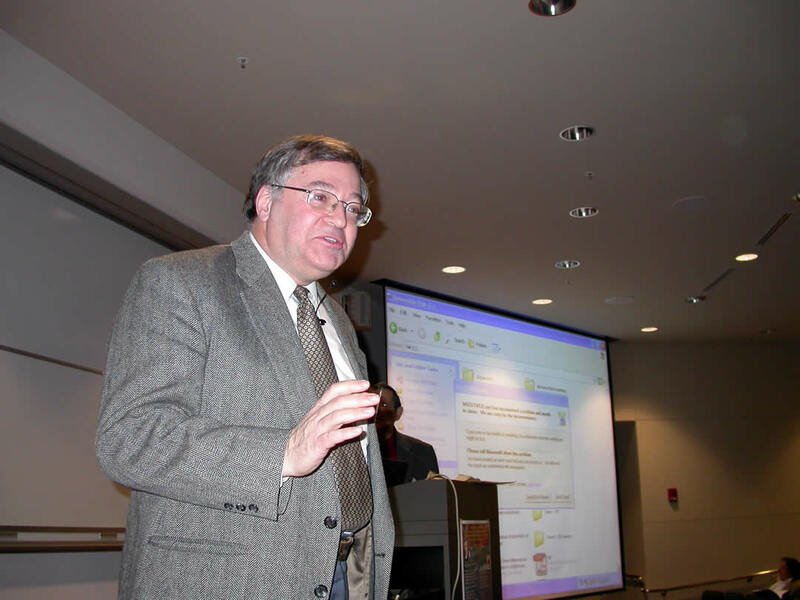 Dr. A. Kavokin delivering his lecture. 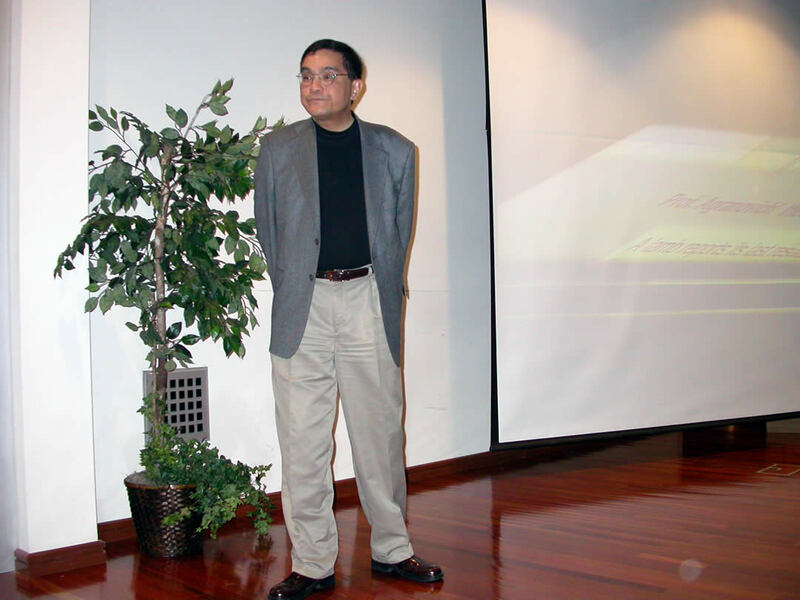 Dr. Alex Maradudin of UC Irvine, one of the active organizers of the Symposium, was delivering his lecture. 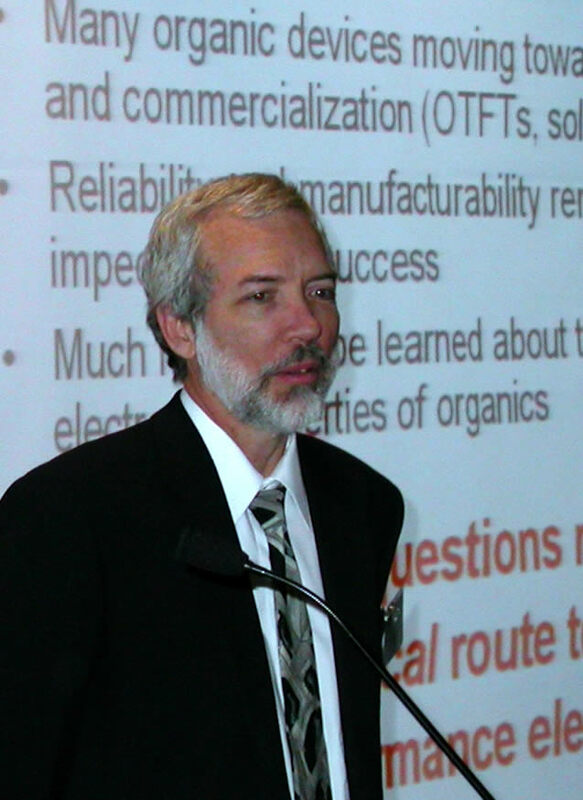 Dr. Doug Mills also of UC Irvine giving his lecture. Posters gallery of the Symposium. 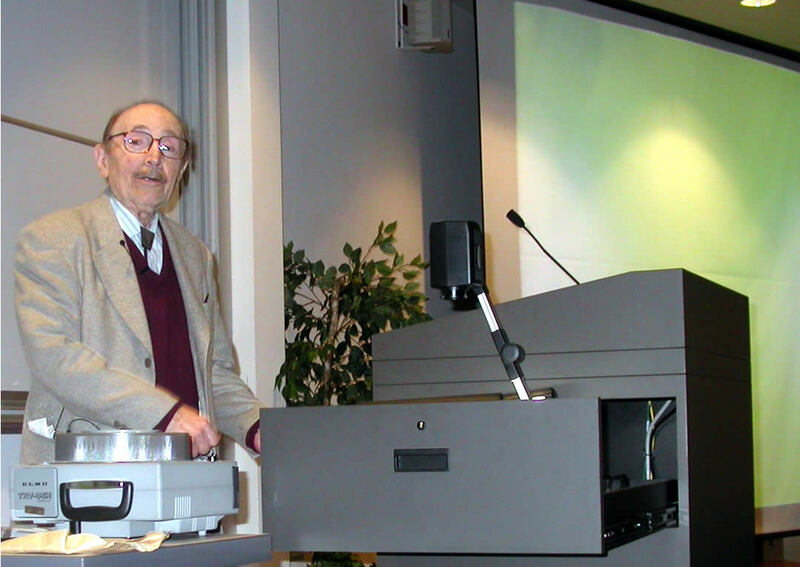 One of the pioneers of �spintronics�, Dr. Emmanuel Rashba of MIT (and previously of the famous Landau Institute of Russia) giving his talk. 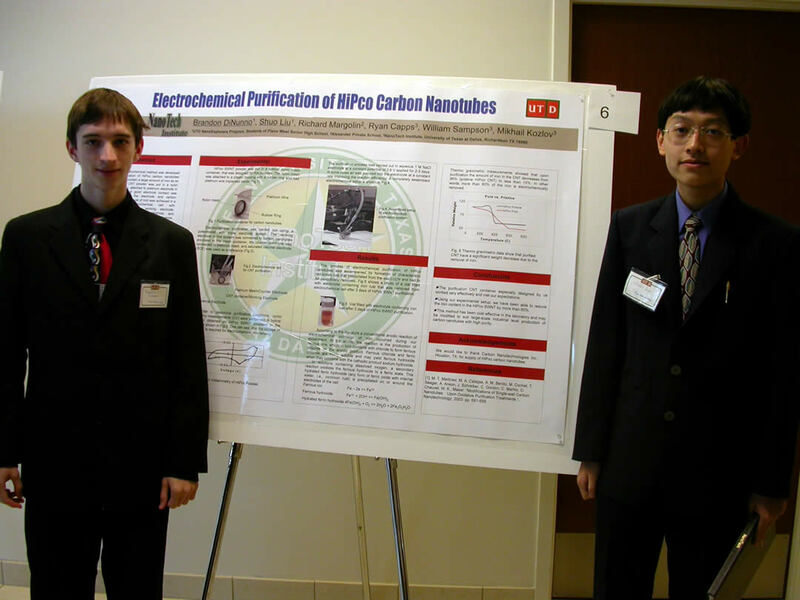 Two students from Plano West High School Brandon Dinunno on the left and Shuo Liu standing very proudly in front of the poster they have prepared (based on their research). 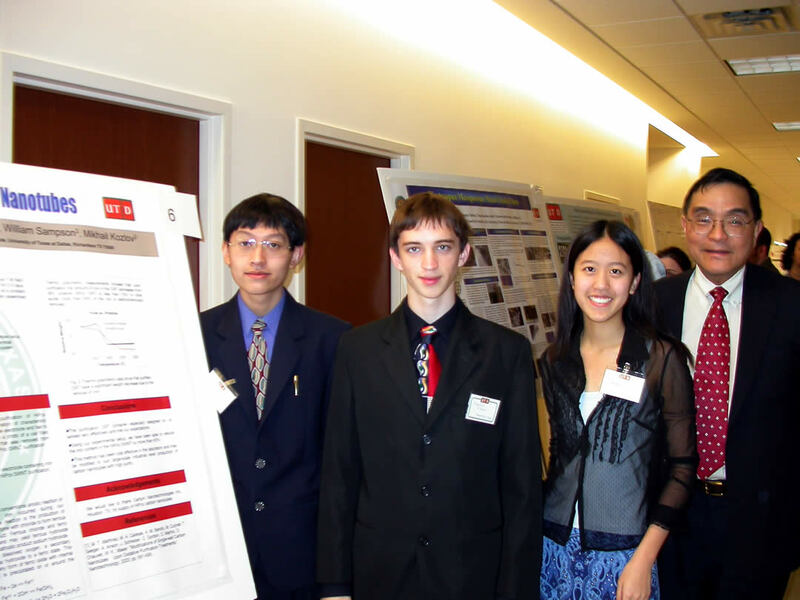 Another Plano West High School student Tiffany Lin (the only female in the picture). 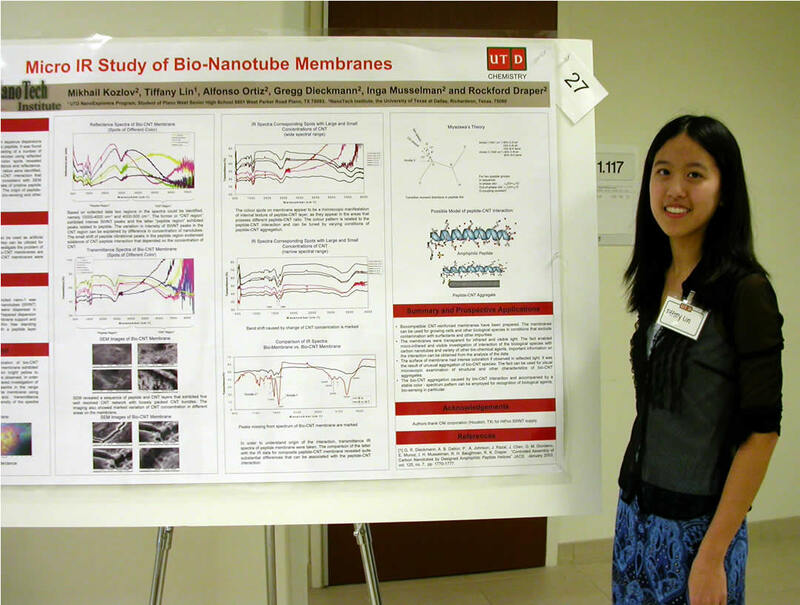 Tiffany also did some marvelous research at UTD�s NanoTech Institute. Tiffany Lin in front of her poster. All the high school students with Ray Baughman. 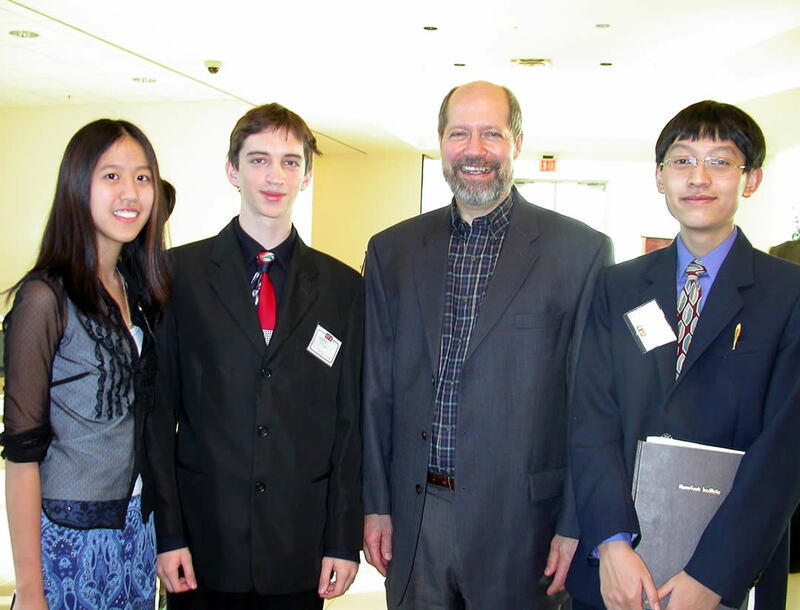 Another picture of the high school students with Ray Baughman. 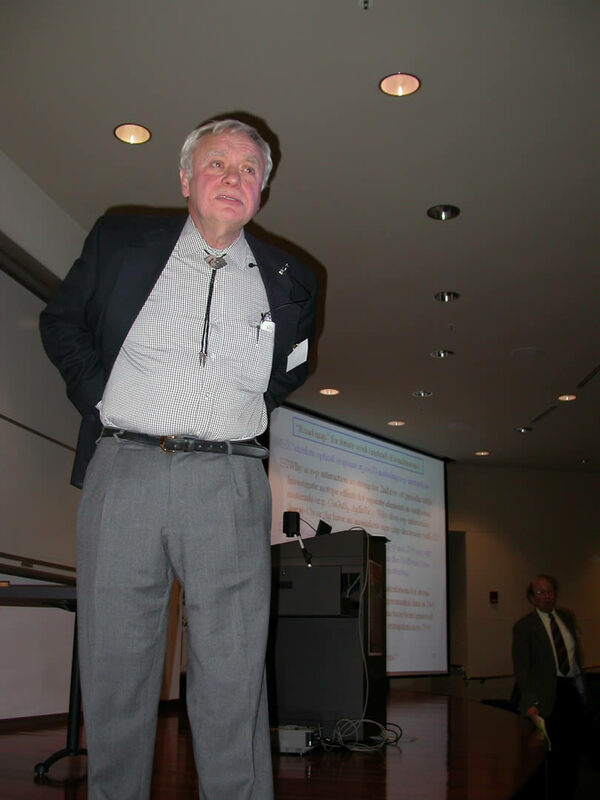 Valy Vardeny of the University of Utah delivering his lecture on spintronics. Valy Vardeny wondering why such a question could be asked! 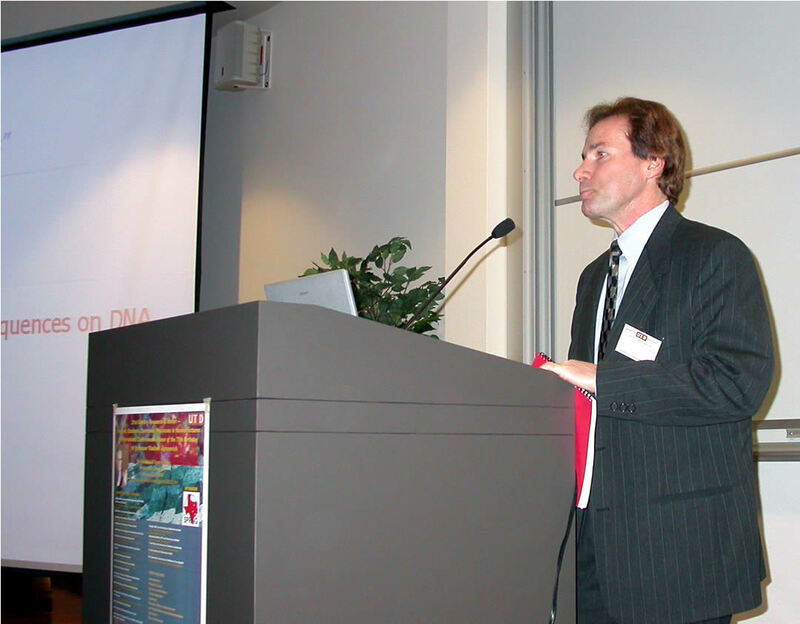 James Von Ehr of Zyvex Corporation introducing a speaker. 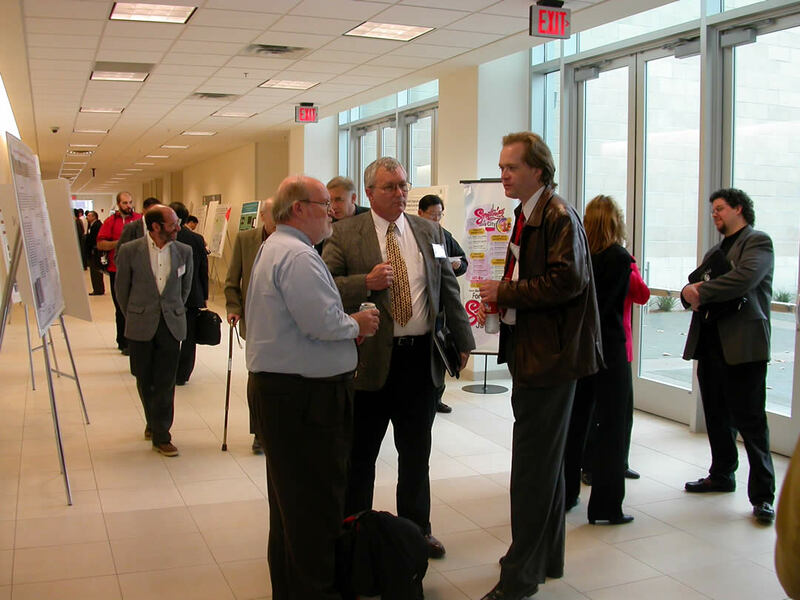 James Von Ehr discussing with another attendee during the break. Two old friends from Harvard, Eli Yablonovich of UCLA and Ray Baughman of UTD talking about the old days in Harvard Square! 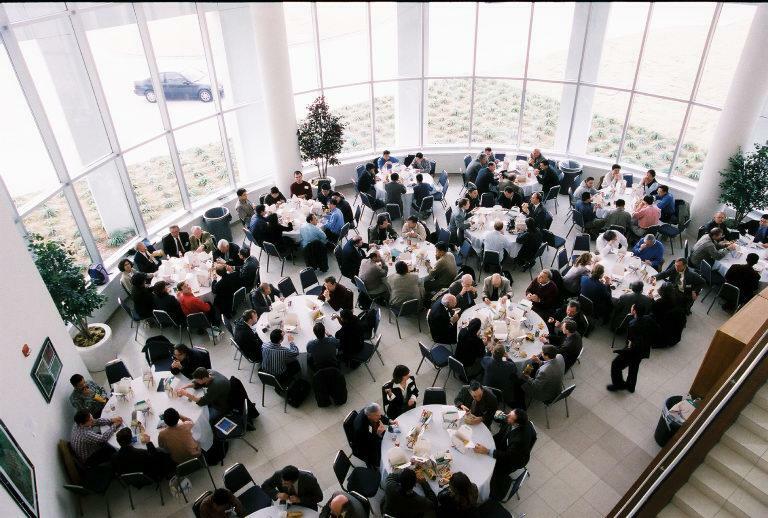 Lunch break at the Symposium.